When I was in college, there were only four “P’s” in marketing: Product, Place, Price and Promotion. As our economy moved from a manufacturing and extraction to a service-based economy, a fifth “P” was added to the list: People. Contemporary marketing’s ever-expanding checklist of “P’s” also include; positioning, publicity, pass along, and permission. Sound familiar? #1 You have to be #1. #2 Stand out from the herd. 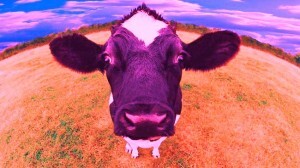 Zip +4, the US Postal Service’s Purple Cow, was a great success. Zip+4 helps marketers target neighborhoods, significantly reducing bulk delivery costs. The new system was a complete over haul, changing how USPS customers do business, improving services customers care about. #3 Hard times are great times for Purple Cows. In the book Marketing Outrageously, author Jon Spoelstra recession decision makers may conclude they “can’t afford to be remarkable.” A seemingly“safe” choice, but “boring always fails.” Hard times are the right time for Purple Cows. Otis Elevator Company recognized the frustration of elevator riders who experience 5-15 stops on the way to their floor. Their “Purple Cow,” is a centralized control panel allowing you to key in the floor you seek. In return, the panel tells you which elevator is going to take you to your floor, turning each elevator into an express. Dutch Boy Paint stirred up the paint business by introducing a Purple Cow “so simple, it’s scary.” Altering the can design to easier-to-carry, easier-to-open, easier-to-pour, easier-to-close version of a paint jug. This innovation got Dutch Boy increased sales and distribution while increasing their retail price!